This cookbook was kindly provided by Appetite Random House. The review and opinions expressed below, are completely my own. 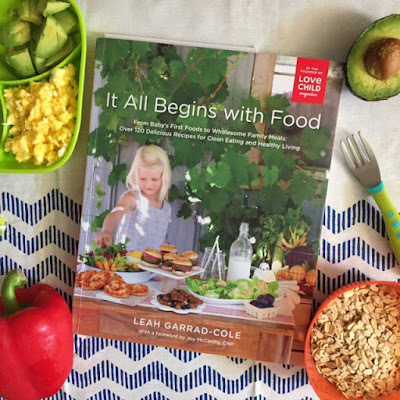 Leah Garrad-Cole’s, It All Begins with Food, is so much more than a cookbook! Personally speaking, it has been a wonderful reference guide and source of support (and inspiration!) when it comes to creating our weekly menus. When I was kindly offered this book to review a couple of weeks into our recent endeavours to eat better, I was hoping it would be exactly what I needed to give us some sort of direction. Not only are the recipes fantastic, but the method, steps and information are all presented in an approachable manner - not demanding diets be this way or that, or instilling any guilt. Too often the conversation around what we feed our family (and young children in particular!) takes heated and controversial tones. It seems everyone’s paediatrician or doctor has a different opinion and, in my perspective at least, it feels like the guidelines change month to month! My boys are 15 months apart, and when it came time to discuss starting our youngest on solids the advice was completely different from that of our oldest (only a year earlier!). Searching the terms “Baby cereal” and “baby lead weaning” spark threads that go on for pages with countless different views. And I’m not even going near the formula vs breastfeeding debate. Feeding your family is stressful from so many different angles. From the amount of criticism and opinions openly offered, to the ingredients available, time with which to prepare meals and throw in allergies and picky eaters and you’ve got a recipe for disaster! Initially, in the NICU N started out with an NG tube. That was followed by a specialized high-calorie formula to help our tiny little guy grow! We must have switched formula brands over 5 times (with countless different varieties within in each brand attempted as well). Then came the months of OT for feeding issues. And today? Getting him to eat more than a couple of bites of anything is my mission at every mealtime. It isn’t only N whose meals could use some tweaking. I will admit, my meals throughout the day are rarely ever planned and function more around convenience and what I can grab between cleaning up, nap time, trying to get some work done, organizing our schedule and school/camp pickup. More often than not that means a quick bowl of cereal or whatever is left over from the kids' meals. Pretty glamorous for a supposed food blogger right? At the end of April, with the encouragement of my husband, we decided to change that. We wanted healthier meals throughout the week, and options that were easy enough to prepare that we wouldn’t feel discouraged and jump back into our diets of bagels and cereal. This book literally arrived within three days of this new adventure. I love that Leah chose a direction for the book that is so approachable and warm while still being informative and unwavering from her intention to help those looking for a route to clean eating and healthy living. She understands that life is busy and hectic, and that sometimes it’s easier to just grab something and go (she actually started Love Child Organics, which makes organic, nutritious purees among other products, that are free from preservatives, fillers, refined sugars, pesticides, GMOs and anything artificial!). She understands that making (and feeding our kids!) tasty, healthy food isn’t always easy. This cookbook is now my textbook. It’s what I refer to when I find other recipes to see how I can make them healthier, or what Leah has swapped in or out of her recipes and how I can apply that elsewhere as well! Leah has the experience from a wide breadth of areas, from coming from a family of women who love cooking to being a teacher and administrator with children who often dealt with issues of food security, as well as having worked in a respite school. Having kids of her own now, it’s clear that this book is the result of firsthand knowledge and experience. Too often I’ve felt books of this genre are unattainable and flipping through them has left me discouraged. As I flipped through the beginning of this book however, one quote was highlighted that made me feel right away that this was going to be different. Just nine pages into the book, Leah openly spoke about the pressure to cook homemade food and make one meal for everyone to eat together every night, how we don’t have 48 hours in a day to get everything done, and sometimes we need to rely on prepared food. Above all, it’s written for parents – and from one parent to another. The key is easy to understand, and provides insight into which recipes can be frozen, which are gluten free, plant based, dairy free, egg free and more! There's also a chart for basic substitutions to help make recipes healthier or conform to certain diets (i.e. substitutions for egg replacement). I love that Leah encourages creativity and adapting recipes to suit personal tastes, rather than sticking to what’s laid out in front of you regardless of whether one simple addition or substitution would make it work better for your family! For those who are looking for more information and details specifically concerning organic food, there’s an entire chapter including definitions and comprehensive information. There are also sections on stocking a “clean” kitchen and pantry (prettily colour coded, which caught my attention right away and helped ease some of the overwhelmed feelings when looking at all of the alternatives and information provided!). There is so much information that this really serves as the only guide you need to not only start you on your way to healthy eating, but also help you maintain your goals and expand on them once you achieve a level of comfort and familiarity with the ingredients and options available to you! The information portion of the book concludes with meal planning tips as well as tips on nurturing adventurous eaters and finally a guide on starting your baby on solid food! There are countless guides, troubleshooting information, allergy guidelines and help, tips and an abundance of support to get you started on this exciting chapter! I cannot do justice to the amount of information and resources the book provides parents with, other than to say that the first full recipe doesn’t arrive until page 84! Everything before that is getting you set up to approach this journey with the utmost knowledge, confidence and support possible! I love that the book begins with baby’s first foods and takes you straight into family meals. It's the book you NEED when beginning solids, but one which will also carry you well into the future of everyone around the table for family dinner! The recipes are straightforward, the directions are clear and concise, and they are all approachable and not intimidating. For the most part, the beginner recipes have a handful of ingredients, all clean, healthy and readily available. Recipes progress to finger foods (which honestly make great snacks for any age – who doesn’t love sweet potato fries?!) and I love that they’re freezable! The smoothie section is fantastic with a whole chart on how to create your own combinations while ensuring the most nutritious outcome. The “Superhero Breakfasts” and lunch sections provide endless meal inspiration, basing recipes on familiar dishes with healthier ingredients (lasagnas, quesadillas, soups and dips!). Yes, the ingredients are healthier, but they’re incorporated into familiar dishes, not asking you to leap too far our of your comfort zone. The family dinner section has to be my favourite! One-pan roast chicken, tacos, shepherds pie and ALL HEALTHY! 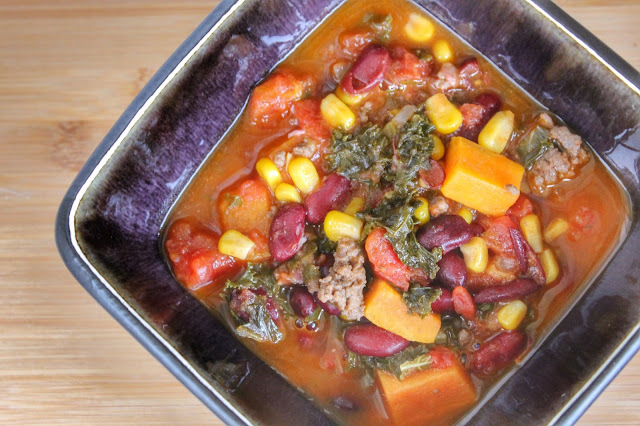 My absolute favourite is the “Best Ever Turkey Chili Soup”. Yes, it has kale. Yes, it is the middle of the summer. Yes, we have it weekly! I make one batch, freeze half and two dinners are taken care of! And it is soooo good! Honestly, one of my favourite dinners now! I love that it’s not only easy to prepare, and so healthy, but it’s actually really, really delicious! Like I said at the beginning, feeding your family can be a very challenging experience. Add in allergies, or any other complications and the stress level sky rockets. Try to make it all healthy and homemade on top of that and you’re rapidly approaching territory which feels absolutely impossible. I hope this review has helped to show you that it isn’t and that there is a guidebook out there for people like us who have for too long relied on breakfast for dinner, bagels and cereal while maintaining that tomorrow will be different. All those times I’ve bought lettuce and vegetables only to throw out before heading to the grocery store the following week. All those misguided attempts at eating healthy without having a true understanding of what that even means. Pick up this book. You’ll get so much more than recipes from it (although, seriously, try the turkey chili soup!). The knowledge and support within its pages will carry you though the beginning of your path to clean eating and healthy living, and well beyond that!